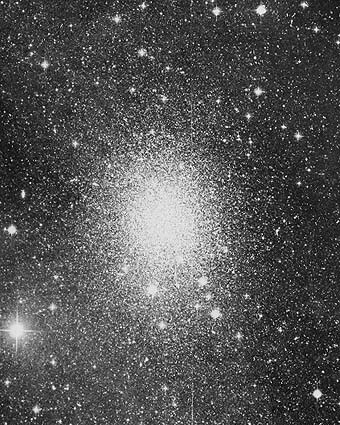 The Sculptor Dwarf was the first dwarf spheroidal galaxy to be discovered, in 1937 by Harlow Shapley, on photographic plates made with the Harvard 24-inch survey telescope at Boyden Observatory, South Africa (Shapley 1938, Baade and Hubble 1939). This type of galaxies differs from dwarf ellipticals by an even lower surface brightness. Our image was obtained by the Anglo Australian Observatory; it is copyrighted and may be used privately only; ask their Photo Permissions Department (photo at aaoepp.aao.gov.au) for any other kind of use. The Sculptor Dwarf is Rich Jakiel's Ultimate Challenge No. 2 for advanced deepsky observers. This faint galaxy has been visually observed by advanced amateur astronomers under very good viewing conditions with instruments starting at 6-inch (15 cm) and low power (30x and less).